At reader Issa’s request, I was trying to take some photos of the work clothes I bought from Marks & Spencer during my holiday, but I kept getting distracted by a bargainlicious find. It distracted me in the store as much as it still does so I figured I’d share this piece instead. 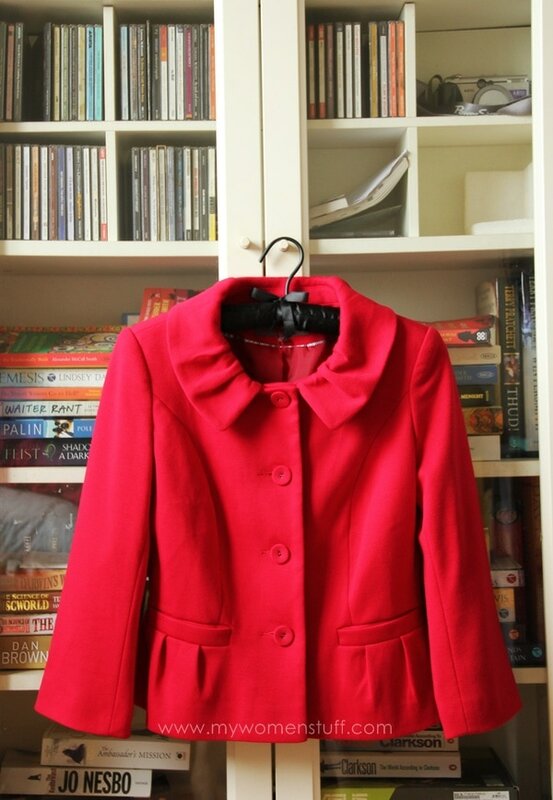 I picked up this very bright red short jacket from the bargain rack at the Marks & Spencer store. It was just sitting there, all its lonesome, looking quite forlorn. I don’t even know why no one picked it up. Maybe they didn’t like the bright red, or thought it might be hard to pull off for work. Or perhaps no one liked the cropped sleeves. It ends about partway down the arm. Still, I picked it up, looked at the size, looked at the price, opened my eyes wide with surprise, grinned with glee and put in straight into my shopping basket. And here’s an example of how I’d wear it, paired with a fitted top and a pencil skirt. 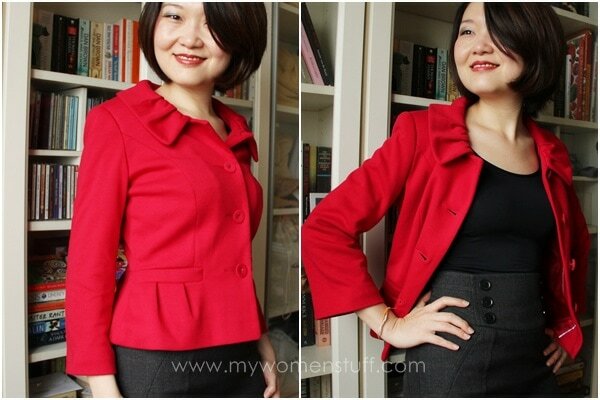 Jacket and high waisted pencil skirt from Marks & Spencer (RMB69 – RM35) and Bra Top from Uniqlo (RM39.90) – all on sale! Posing er… fail. I could and should probably accessorize it a little but I’m a bit of a accessory dodo so I tend to be unaccessorized most of the time. I like wearing colour whenever I can. Black is corporate but damn, its boring. I poked around a little and I just realized why this was slashed down to such a ridiculous price. Its by Portfolio which is a line discontinued by M&S. Desne! So, I keep saying it was a bargain. Just how much of a bargain really you’re wondering? Well, try RMB49 which roughly translates to RM24.50 or perhaps just a little less. You tell me, bargain or not? 😛 How could I have put it down?? Do you like colours for work? Or do you have a sombre workplace that needs you in black white and *yawn* shades of grey? Thanks Amanda 😀 I love food from M&S too! They do really good crisps and they are among the best I can get locally at a good price 😉 I have checked out Massimo Dutti but I wasn’t terribly impressed too and the prices shocked me.